I think we do not need to discuss the importance of good makeup & hair styling for a bride’s wedding day. It simply feels good to look good! But how to find professional makeup and hair styling for a wedding in Bali ? Are there any good makeup artists available in Bali? The good news is that there are a few options available for professional makeup and hair styling for a wedding in Bali. But you will need to be selective because there are also some mediocre stylists in Bali who do not adhere to the standards an international bride would expect. Some brides do consider having a friend who is attending the wedding to do the makeup & hair or even do it by themselves. While this may be a perfectly fine approach in some cases it poses the following potential problems. 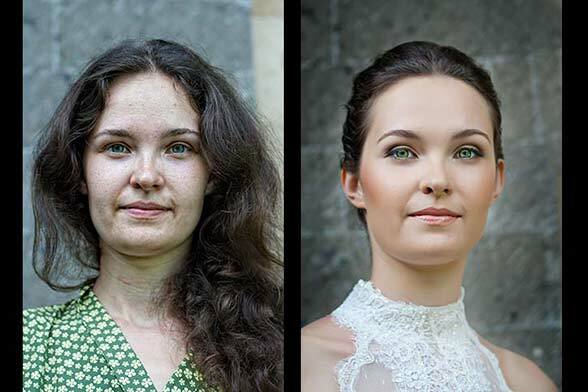 Many bride’s and their friends doing makeup & hair may underestimate Bali’s very humid, tropical climate. So you normal choice of makeup and cosmetics may not be appropriate for Bali and may deteriorate faster than you expected. The same applies for hair styling. A good stylist in Bali will take the special conditions in Bali into consideration when choosing cosmetics and styles of your makeup &hair. Therefore you are well advised to appoint a good Bali based makeup & hair stylist who can apply a styling to you that will not only look good in the room where it is applied but hold until the evening when your reception is in full swing. Have your stylist stay until the reception for some patch up during the photo session. And then for a touch up before the reception. Be cautious though and chose a reputable and experienced makeup artist who uses international standard cosmetics and tools. For more makeup & hair options you may want to turn to Google. 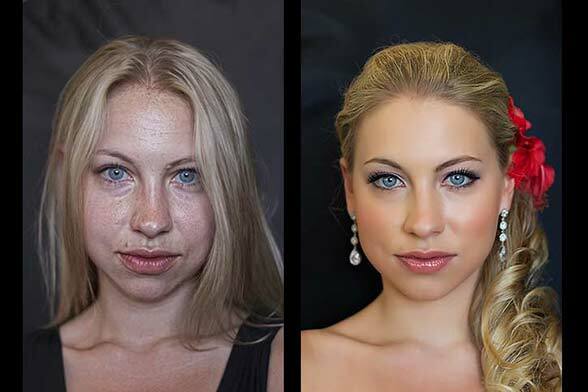 Be careful with makeup artists than come with a all-inclusive package you have bought from a hotel or elsewhere. Often wedding packages that come with makeup & hair styling are of inferior quality. 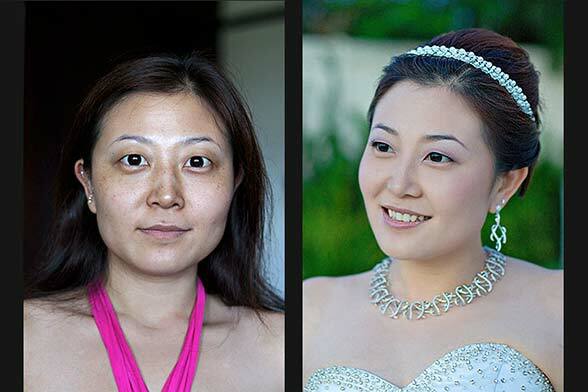 Would you if you were to do a wedding back home hire a makeup artist and/or a hair stylist before seeing an extensive portfolio of that person’s work? I am often amazed how much clients rely on the recommendation of their wedding vendor or the package offered by hotels / venues / chapels, etc… only to find out that what they booked is not what they hoped for. It is a good idea to book a trial on one of the days before the wedding. That will allow you get acquainted with your stylist. It will also allow you to try out various looks and styles. That in turn will give you the confidence to look your best on your big day. Please send me an email if you need more information about professional makeup and hair styling for a wedding in Bali. I had my wedding in Bali only 2 weeks ago and they were amazing! Very professional and did an excellent job! Highly recommended! Thank you so much Terri-lee. I am glad that you were happy with the services of Tia and her team. I just wanted to make the time to say a huge thank-you to the ladies who came to do our make-up and hair on our wedding day. They were so prompt (no mean feat considering their journey), super efficient & did an absolutely first class job. To have 6 happy ladies at the end of it is really a very significant achievement. Also they were friendly, helpful and made it a very relaxing enjoyable experience. Just wanted to say a huge thank you to the wonderful make-up artists who made us feel and look wonderful on my wedding day. Especially the lovely lady who did my touch up make-up. Can you please thank them once again and tell them how happy we were for their service. On Sunday 7th September a lady came to do my hair and makeup for my wedding day. Really loved what she did, and I would definitely recommend you. I had my wedding at The Padma Resort, Presidential Suite on Saturday 26 July. Natalie Foster from Weddings by Natalie was our wedding planner. I just wanted to say a huge thank you for making my four bridesmaids, my mum and me look absolutely beautiful with our perfect make up and hair. All the girls and all of our guests were blown away by how beautiful the make up and hair was. The bridesmaids had side braids with a side messy bun and they looked absolutely flawless and classic. We could not have been happier. My hair was an absolute dream, with a messy side bun, some height at the top and as per my request, hair that covered my ears! Your staff were amazing and advised me that a sweeping side fringe would be best to be slightly pinned and not cover too much of my face as the hairstyle would not hold in the heat. My stylist created a beautiful loose side fringe that was pinned in place and stayed there all night. I am of Korean descent (but I am Australian) and my makeup was stunning and perfect for my eyes and skin tone. My bridesmaids ranged from Korean, Portugese, Italian (fair skinned with blonde hair) and half Phillipino/German and my mum is Australian. You catered for our individuality and we were so happy with the results. One of my bridesmaids is a professional make up artist in Perth and she was so impressed with your professionalism and knew we were in the hands of extremely experienced make up artists. All of us will happily recommend your services to anyone we know looking for flawless makeup and beautiful hair. Thank you again for making my wedding so perfect. I cannot thank you enough. We had two of your staff members do our hair and makeup for my wedding on Friday July 11th. Just want to thankyou for the amazing job they did. They were both very professional and extremely talented. They did the most beautiful job and we got so many comments on how great it looked. The airbrush foundation lasted all night it was amazing. I would just like to say thank you and tell you how amazing the ladies were that came and did myself and my bridesmaids for our hair and makeup at Villa Phalosa for my wedding. They were amazing I was so so happy and we all got many comments. I will try send some photos when I get them back from the photographer. I will definitely recommend your services to everyone!. I had my makeup and hairstyling done by BALI MAKEUP & HAIR on my pre-wedding and it was fabulous. At that time I knew that I had to have them to do makeup and hairstyling for me, my bridesmaids, my mum and sisters in my wedding. Their work and service was very professional and to a high standard. The team did an excellent job working to schedule and made everyone look stunning! Upon researching online the various options for hair and makeup for my upcoming wedding in Bali I sent numerous emails inquiring about services offered. Tia, from Bali Makeup & Hair responded to my inquiry almost immediately and provided me with details of the range of services available. Booking and payment was done effortlessly and on my wedding day the girls arrived promptly. They were extremely professional, listened to what I wanted and fulfilled all my wishes. I was extremely happy with my hair and makeup on my wedding day and wouldn’t hesitate to recommend the services of Bali Makeup & Hair to any bride making plans to wed in Bali. I would like to express my gratitude to Bali Makeup and Hair for doing up my make-up and hairdo so nicely for my pre-wedding photoshoot in Bali 1 month ago. The make-up artist was patient and accommodated to my every requests. I had my wedding makeup & hair in Bali done by BALI MAKEUP & HAIR. I was very impressed with their professional services. Not only did they do a fantastic job with my hair and makeup, but we were also very pleased with the communication we had with them in the month leading up to the wedding. All our questions were answered promptly and they were very easy to deal with. We highly recommend the services of BALI MAKEUP & HAIR to brides wanting to have excellent makeup & hair styling services for their wedding in Bali!! Thank you Kirsty !! I am glad that you were satisfied with the services of our distinguished member company BALI MAKEUP & HAIR. I would like to say how fantastic Bali Make-up & Hair were on my wedding day, which was on the 28th December 2012!!!!! Not only did they do my make-up and hair for the wedding day, i also organized to have a trial on the 26th Dec 2012 which was super important because we got to try heaps of different looks to find out which one i was 110% happy with!!!! On the wedding day Bali Make-up & Hair also did my Mother and my 2 bridesmaid’s hair and make-up and WOW they absolutely LOVED it all!!! Not only were they over the moon with how they looked but i was speechless, they looked sensational and it was all because of the girls at Bali Make-up & Hair. All of the girls at Bali Make-up & Hair are SO BEAUTIFUL, they really listen to what you want and give you advice on what they think will really look the best!!! I am so pleased that i had Bali Make-up & Hair do my make-up and hair because i felt completely amazing and beautiful!!!!! They are SIMPLY the BEST in BALI. I really recommend to anyone that is getting married in Bali is that you CHOOSE Bali Make-up & Hair and make sure you get a TRIAL it’s 100% WORTH it!!!! Thank you so much from the bottom of my heart!!! The Bali Make-up & hair team made my day a dream!!! Dear Fauve, thank you so much for this. I will pass this on to Tia and her team ! I would just like to express my thanks for the beautiful job Wayan from balimakeupandhair.com and her team did making me into the most beautiful bride I could be! I’m so happy to have been able to share that very special time with her before I became I married woman!! It was a lovely time. All the MOTHERS looked stunning and enjoyed every minute of being pampered. I will be recommending them to anyone that wants to get married in Bali in the future! Pass on my sincere thanks and gratitude to all people involved. Best wishes and all the best for 2013!! Thank you so much Rebecca ! I will pass on your testimonial to Tia and her team. Your wedding was indeed a very, very nice one. For those interested you can see photographs of Rebecca’s wedding in Bali here. wonderful job which Wayan from the BALI MAKEUP AND HAIR team did on my wedding day. She made me look so beautiful and I was a very happy bride. Please extend my huge appreciation to Wayan. I just want to Thank the ladies from BALI MAKEUP & HAIR for Our Wedding Makeup and Hair. We were very happy with the finished product and the service. We will be recommending them to everyone we know. My son and his fiancee are getting married in Bali, Grand Hyatt Bali, Nusa Dua, next year in April. 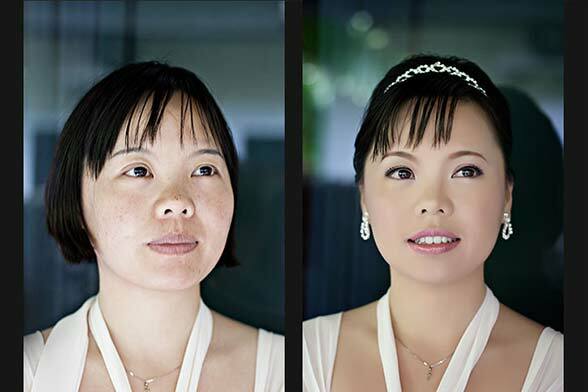 Although make up for the bride and groom will be done by Infinity Chapel, Conrad Hotel ( as it comes with the package ), could you recommend a good wedding make up artist please ? I wanted tell you that I was over the moon about my hair & makeup that was done for myself and my guests yesterday. I really thought the team from BALI MAKEUP & HAIR were great and they did a fantastic job – I looked like a princess thanks to them. The hair-styling and the makeup was unbelievable and I wouldn’t hesitate to recommend their highly professional services to anyone.